PRES- 46F-18-G is a name of vessel Nautitech 46 Fly ,which was produced in 2018. You can charter this yacht from harbor Athens around Athens. PRES- 46F-18-G is furnished with 10 beds. Berths on the vessel are configured in 10 layout. 6 bedrooms are situated inside the sailboat PRES- 46F-18-G. Find about more yachts under this link: Catamarans Athens. Passengers can feel good on this vessel , because there are 4 WC with showers for their disposal. With 600.00 l l. in fuel tank you can sail really far and still be independent because of 600.00 l l. in water tank. PRES- 46F-18-G is powered by motor 2 x Volvo 40 hp. Yacht's dimensions are: LOA - 13.71 m , beam - 7.54 m and 1.45 meters of depth. Nonrefundable deposit has value 0.00 EUR. 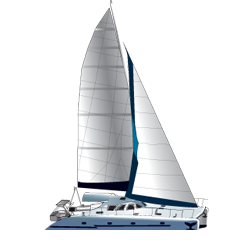 In our search engine you can quickly check avalailability of sailing boat PRES- 46F-18-G from Athens right here: Catamarans Greece.